Dark green suede and brass details were used by Alain Carle Architecte to make this store for skincare brand Aesop feel like a jazz club. 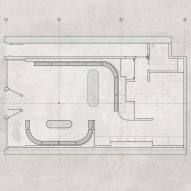 The local firm designed the interior for the store in Montreal's Petite Bourgogne – or Little Burgundy – a neighbourhood in the southwest of the city, historically known for its music scene. "The interior draws influence from the neighbourhood's heyday as a jazz hub, when the music of Oscar Peterson or the Sealey Brothers could be heard from the streets," said a statement from Aesop. With a combination of dark, rich and natural materials, the shop is evocative of a speakeasy. "All of the brass used in the store is solid brass, and we added dark green synthetic suede for a reference to the jazz club," Alain Carle Architecte told Dezeen. The storefront features large windows, with inside revealing a symmetrical plan. White oak custom-made cabinetry wraps around the space in a curved shape, acting as a divider and adding intimacy to the store. "Recalling the feel of a private club, the space rounds and winds like the shapes of a wind instrument, evoking a decidedly warm and intimate experience," the brand said. The walls and ceiling are painted a dark black, with a matching check-out desk and freestanding wash basin. The sink, which customers are encouraged to use when testing products, is housed in a dark volume and has brass faucets on either end. Floors are kept pale to match the timber furniture that envelopes the space, and comprise wide white-oak beams. Alain Carle Architecte has also designed an Aesop store in the nearby area of Westmount, while another in Mile End features rustic timber and limestone elements by local studio Naturehumaine. "Montreal combines rich history with vibrant cultural life," said Aesop president Stuart Millar. "Each neighbourhood offered a fertile ground for architectural interpretation." 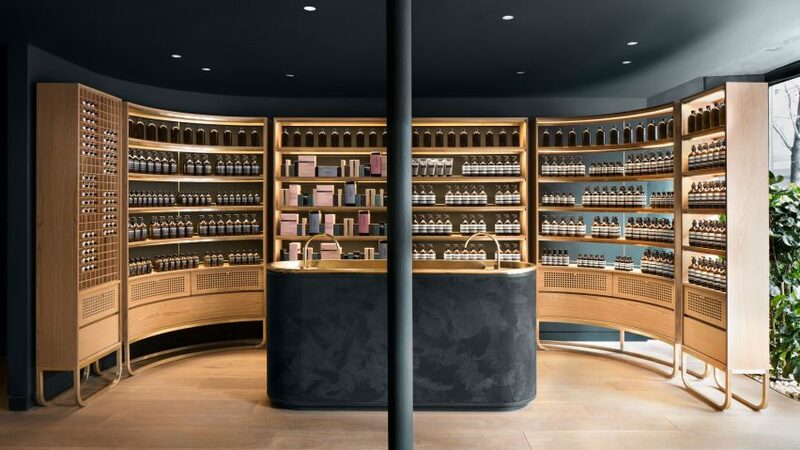 No two Aesop stores are alike, as the brand's founder explained in an interview with Dezeen. Others in Canada include a grey-toned store decorated with custom-made lamps by MSDS Studio in Toronto.